Contact us and submit the information we need to create a beautiful postcard which contains all the information that is required to help you sell your products and services. You know your business best and we know what works best to attract attention from your customers. A perfect match for an efficient and well designed postcard that will increase your sales! After our discussion about your target audience and the details of your business to know how we can best help you. 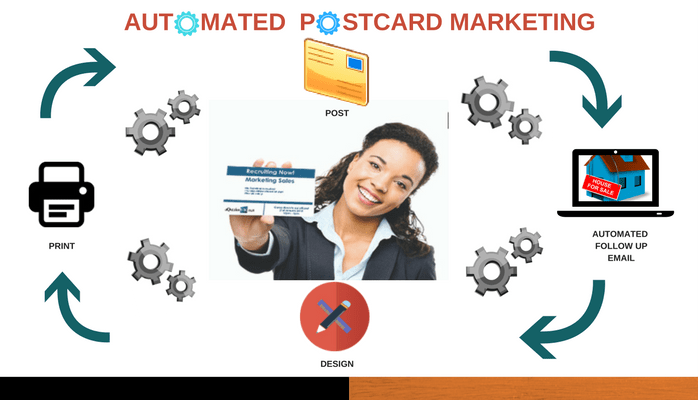 Automated postcard marketing is a new technique in directmail marketing. Not only are your customers able to receive Emails and SMS but they can also hold something in their hands which increases their attention span. This method has always worked well and proven to bring results. If you want to find more customers, using our Automated Postcard Marketing is a targeted, personal and cost-effective way to capture and keep your customers’ attention. You can let them know what you have to offer – and get a clearer picture of what they want. *Though we recommend 180 day minimum commitment but this flexible plan is for customers that want to do less or more postcard campaign.